rchbishop Khajag Barsamian, Primate of the Diocese of the Armenian Church of America (Eastern), visited St. James Church of Evanston, IL, on Sunday October 25, where he consecrated four new icons and blessed a new khatchkar installed on church grounds. The occasion marked the 70th anniversary of the church’s consecration. Following the Divine Liturgy, Archbishop Barsamian presented longtime parishioner Anna Marie Norehad with the “Sts. Sahag and Mesrob” medal and Pontifical Encyclical. Ms. Norehad served for many years as the parish’s delegate to the Diocesan Assembly and was a choir director. She is active in the Women’s Guild and continues to serve the choir as an organist. “For Anna Marie Norehad, her inspirational legacy began with her parents, Onnig and Christine. Anna Marie also drew great inspiration from her uncle Bedros Norehad: one of the most distinguished and productive intellectuals of the formative years of our community, who left a profound mark on the Diocese, AGBU, and other institutions,” Archbishop Barsamian said. As part of the parish’s celebration of the church’s 70th anniversary, Archbishop Barsamian consecrated four new icons. 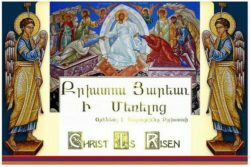 A painting of the Holy Mother-of-God and Christ by Italian-Armenian artist Vigen Avetis will be hung on the main altar. Three other icons will be displayed in the sanctuary: two are replicas of icons of St. Thaddeus and St. Bartholomew, the originals of which are found at the Cathedral of Holy Etchmiadzin. The third—an icon of St. Thaddeus, St. Bartholomew, and St. Peter—was a gift from St. Nicholas Catholic Church of Evanston on the centennial of the Armenian Genocide. Archbishop Barsamian and Fr. Khoja-Eynatyan led a procession outside where the Primate blessed the church’s new khatchkar. 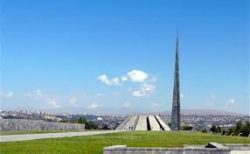 The monument—a project taken up by the entire parish—was designed by Ruben Nalbandian in Armenia. It is dedicated to the newly canonized saints of the Armenian Genocide of 1915. Parishioners then placed flowers at the base of the khatchkar in honor of the Holy Martyrs of the Armenian Genocide. At a luncheon following services, parishioners posed for a panoramic photo of the community in celebration of the parish’s 70th anniversary. Parish council chair Gevik Anbarchian opened the program with welcoming remarks. 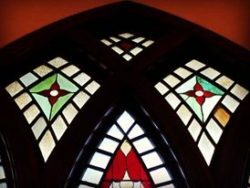 “Having inherited this parish from our founders, each subsequent generation has sought to further beautify and thus glorify this house of God by adorning our church with concrete symbols of who we are and what we believe as Armenian Christians, including our newly consecrated khachkar,” he said. The St. James Children’s Choir, under the direction of Dn. Kavork Hagopian, gave a musical performance. PHOTO GALLERY OF OCTOBER 245th EVENTS. Episcopal Liturgy and Honoring Anna Marie Norehad.